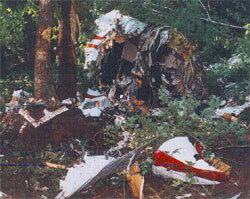 A plane crash survivor is unlike any other victim. This is because the experience of flying is so unnatural to us. We don't have fins or wings because we were meant for earth. Since flying is inherently dangerous, we take precautions before we fly. Some of us say a little prayer, some have a lucky charm, others look at pictures of loved ones. But rest assured, all of us are thinking what would happen if something went wrong. Why Airplane Crash Injuries Are So Different. First of all, our natural habitat is the ground, not the water or the air. So it is utterly unnatural for us to be in the air, since we are earthbound and do not fly. We do not say a prayer before getting into our car or boat. But, it is quite common for a person to say a prayer or hold onto a locket before a plane takes off or lands. Being 30,000 feet in the air simply runs counter to our natural and instinctive behavior. Secondly, when we fly, we lose control. Unlike driving or riding in a car or even a boat, when we enter an airplane, we surrender that sense that we can fight through a problem or we can escape if we have to. In an airplane, we have to depend totally on the pilots, who are in control, not us. Thirdly, our imagination plays a greater role in an airplane than in any other vehicle. The normal things that can go wrong in a car seem way more dangerous in an airplane. Therefore our whole psychology is different the moment we enter an airplane. For these reasons, when something does go wrong in an air disaster, the impact on us is disproportionately and substantially greater than in an 'ordinary' accident. Since our psychological reaction to an air disaster is so hyper-amplified, it is fair to say that the cure for overcoming the psychological impact of such an incident must take this into account. In addition, post-traumatic stress disorder is a very real concern with airplane crash survivors and must be addressed intelligently. There are many helpful websites that deal with the psychological aftermath of an air disaster. Getting Back On Your Feet Financially. There are a myriad of legal, financial, and insurance issues that confront a person who has come through a plane crash or is a family member of such a victim. What insurance coverage do I have and when does it take effect? Do I have a possible lawsuit, and if so, how do I find someone to handle it? How and when will I get back to work? Where can I get help with new training or coping with new disabilities? You are not alone, and there are many extremely capable professionals who can assist in every aspect of your recovery. If you would like to talk about referrals, or a second opinion or about any and all these matters in greater detail, please feel free to e-mail me at "saber@comcast.net" or call at the toll free number below. How Will I Ever Fly Again? If you have asked yourself this question, you are not alone. There are many extremely helpful resources available to assist you in returning to flight. Just a few of them are listed here, but feel free to call or e-mail and we can talk to you about our many experiences and get you in touch with the right professionals or support group nearest to you. If you are wondering if you have post traumatic stress , contact us and we can talk to you privately.We have information on support groups and good referrals that we can share with you, including people right in your home state.